The 2013 Salsa Fargo 3 is an offroad touring machine! The Fargo is our drop-bar, off-road adventure bike. First introduced in 2008, the Fargo has developed a cult status as a bicycling anomaly: a disc brake only, drop bar mountain bike designed for off-road touring and bikepacking. Drop bars provide multiple hand positions for long rides on singletrack, gravel, and pavement…or possibly, a mix of all three. The Kung Fu CroMoly frameset provides an excellent ride quality without dismissing durability. Use our Wanderlust Rack and Fargo Fork for fully loaded touring. Or carry a light load with the use of a bikepacking setup. Add Anything Cages to the Fargo fork for additional storage space for water, ultralight shelters, or gear. If you’re taking on rougher terrain, the suspension-corrected frame design also accommodates a suspension fork. The Fargo is an extremely versatile beast of burden. 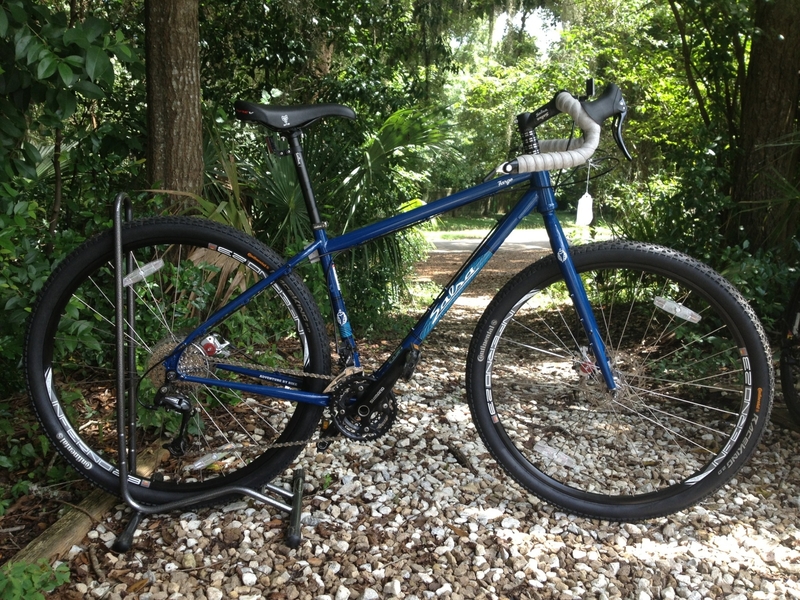 We still have a 2013 Fargo 3 medium, in stock until further notice. Stop by for a test ride or call for more info. This entry was posted in Uncategorized and tagged 2013 Salsa Fargo, Bikepacking, Salsa Bikes, Salsa Cycles, Salsa Fargo, Touring Bikes. Bookmark the permalink.